Looking for a night away from the kids? Are you creating the perfect proposal? Be prepared to be amazed as Hornblower Niagara Cruises recently welcomed its brand new evening cruises that kicked off on June 1 at 9pm dusk. The Sunset Cocktail Cruise is just one of the three enjoyable evening experiences for visitors to choose from while in Niagara Falls, Canada. Visitors from Niagara Falls Tourism along were on hand to capture hundreds of amazing and dynamic photos of the evening. As the 27-degree temperature night turned its skies to breath taking warm colours of oranges and reds, guests anxiously awaited at the Hornblower Landing to board the 700-passenger state-of-the-art-catamaran for its first evening excursion. Not only is Hornblower Niagara Cruises one of the recent new names to the attractions in Niagara Falls, Canada, they have also introduced visitors to explore the mighty and thunderous Falls and well into the evening hours. 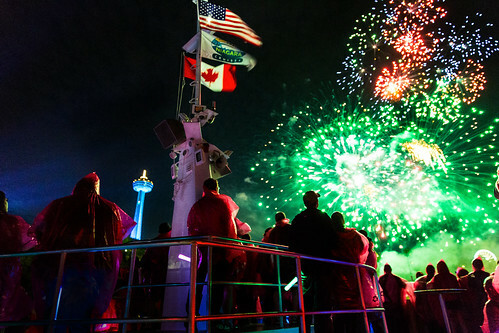 The brand new cruises not only includes the perfect romance experience with the Falls Fireworks and Falls Illumination Cruise. Guests can experience the ultimate romance cruise with extraordinary on board services and amenities including: an on board fully licensed bar with refreshing cocktails, snacks, musical entertainment, and a 360-viewing unobstructed viewing platform. As the boats filled with anxious passengers, guests raved about their amazing experiences in Niagara Falls, Canada and with Hornblower Niagara Cruises thus far. The 35-minute experience allows visitors to enjoy the view of the Bridal Veil and American Falls before it disembarks to take you closer to experience the view of the Canadian Horseshoe Falls. 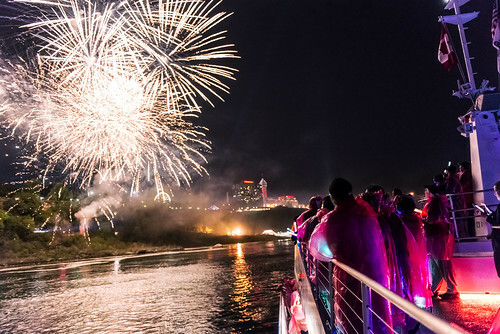 For visitors looking to extend their evening into the later part of the night, they can now do so on board the Falls Illumination and Falls Fireworks Cruise. Both experiences begin at 10pm as the skies blacken above and stars lit up like diamonds. Bring your cameras as these cruise experience bring you under open skies facing all three falls as they light up with magnificent illumination as the sparks fly and radiate the skies above you. These cruises also feature an on board bar, refreshing cocktails, snacks and a 360-viewing unobstructed viewing platform on the top deck of the boats. Add to the magic in the skies above, and purchase a colourful and cool glow wand before boarding to add a splash of colour on board the boat. For visitors looking to get a glimpse of the Falls during the daytime, they can onboard our ‘Voyage to the Falls’ daytime boat tour that operates every 15-minutes beginning at 8am. Looking to relax and enjoy Niagara Falls like never before, purchase your tickets online at: www.niagaracruises.com and see what everyone is talking about!